Swap This! costs about a dollar. When I think about the other things I can get for a dollar - one candy bar, or about 1/3 of a cup of coffee, it's hard to look at Swap This! as anything but good value. It's a simple match-3 (or, more accurately, match-4) action puzzle game, but the thing is, it actually works well, is charming, and offers a depth of gameplay across four different modes of play. For a dollar, that's ridiculously good value. Regardless of the mode you play, the basic gameplay remains the same; you've got a play field filled with colourful fish, and you need to move them around to link at least four of the same coloured fish in a row. Then they'll disappear, and you'll score points in return. Unlike some match-3, where you can only move a block to swap with another block adjacent to it, with Swap This! you can move blocks around anywhere in the playfield, and you'll get really big scores if you can quickly move pieces around so that you'll link up multiple "sets" of fish simultaneously, which results in large parts of the playfield disappearing at once. 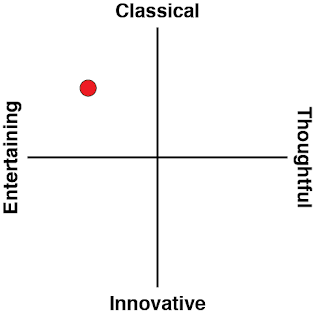 The four different gameplay modes are slight variations on this. There's a mode where you need to score as many points as possible within a minute. There's another mode where you're given a set amount of time to clear as many fish as possible, with the clear number getting bigger with each new "wave". 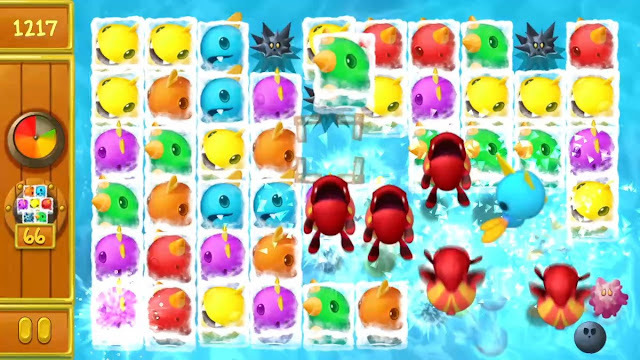 A third mode involves matching fish quickly in order to stop a giant fish catching you and resulting in a game over. Finally, there's a "puzzle mode" where you need to solve specific layouts and challenges. What's impressive is just how extended each of these modes are. The puzzle mode has dozens of stages across three difficulty settings. 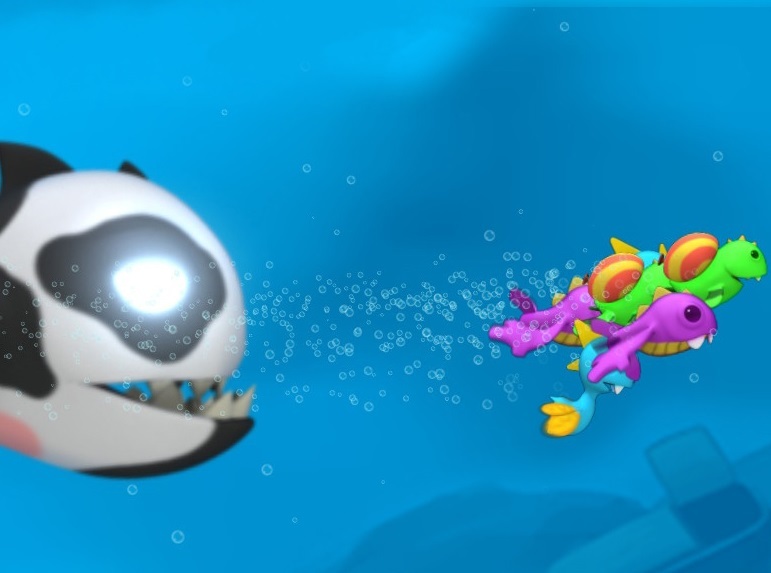 The giant fish mode comes complete with a range of fully animated and colourful giant fish to defeat, and even features little cut scenes at the start and the inevitable end. These are all simple features, sure, but they're also surprising for a game that is pitched at such a low budget. I was expecting something cheap and tacky, but was impressed with how cleanly the game is made. There's even a leaderboard for each gameplay mode, and while it's not the best leaderboard out there (it doesn't actually show you your ranking, but rather the top couple of scores, and then a couple of other player's scores that are close to yours), the fact there's a proper leaderboard at all in a $1 game is an impressive commitment by the developers. It's bright and colourful, too. The fishes are well designed, and different enough to one another that not only are they pleasant on the eye, but they stand out from one another and don't get in the way of the gameplay - you're not going to be fighting with this aesthetic just to figure out what you can, and can't, match. There's also a lovely little tropical ditty that plays in the background without becoming too infectious or irritating. Again, these things don't just happen - Swap This! 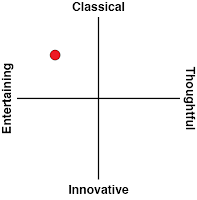 comes across as something genuinely professional. Of course, it's also "just" another match-4 title, and perhaps that's why the developers didn't feel like putting the price up to something more appropriate to the size of the game. Lucky us, then; because while Swap This! is by no means going to end up on anyone's favourite games of all time lists, it's bright, pleasant, and perfect for those times that you do want a quick burst of puzzle action. And all for the cost of candy bar.